New York: Prentice Hall Press, 1991. Hardcover. Small 4to. Burgundy cloth spine with gilt lettering and cream paper over boards, pictorial dust jacket. ix, 322pp. Near fine/very good. 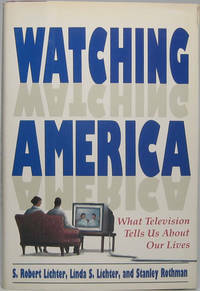 A superb, tight first edition of this study subtitled on jacket front "What Television Tells Us About Our Lives." Inscribed and signed bold and large in blue fineline on front flyleaf by one of its authors: "To Bob Malott / with gratitude for your / support & encouragement. / Bob Lichter." Robert Malott (1926-2018) was a noted Chicago business leader, CEO of FMC Corporation, Republican politico and philanthropist. New York: Exposition Press, 1951. Hardcover. 8vo. Tan cloth with brown lettering, pictorial dust jacket. 132pp. Very good/good plus. Though jacket ispictorial and overall fairly attractive, there's paper loss at lower right of blank rear panel that also includes 1½" of spine and small portion of lower left of front panel. A tight, nice later printing of this travelogue and dance research expedition by the noted Chicago dancer, dance educator and choreographer (1890-1966) -- who boldly inscribes and signs this copy in black ink on front flyleaf: "To Etta Salita, / a very charming / person. / Best wishes / from The author / Gladys Hight / April, 28 -- 1954." Chicago: The Reilly & Lee Co, 1933. Hardcover. 8vo. Burgundy pebble-grained cloth with gilt lettering and rules, pictorial price-clipped dust jacket. 112pp. Near fine/very good. Endpapers age toned as usual; jacket top edgeworn, with a few edge chips and archivally closed (on verso) edge tear -- but complete and bright nonetheless. Tight, attractive first edition of these excerpts from the popular WLS radio program in which this Wisconsinite mostly shared anecdotes, quotations and verse from poets both well-known and obscure with his listeners. Several such two-year compilations were issued. A charming period piece in nifty Art Deco jacket. Known as "The Singing Cowboy," this Western star appeared in dozens of films between 1934 and 1954; turning his attention to baseball, he became successful owner of the California Angels. Printed color program, 4to (8½" X 11"), (12pp), n.p., n.y. Good plus. Edgeworn and either misnumbered (printed page 10 followed by printed page 15 as inside rear wrapper, though nothing appears removed). "Souvenir Program" (front wrapper title) of "The Gene Autry Show... Featuring Gail Davis TV's Annie Oakley" (title page), undated but late 1950s vintage. Numerous illustrations. 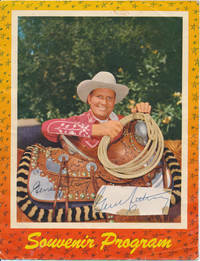 Heavy stock color front wrapper features, within decorative border, a closeup of Autry in Western garb smiling above his horse's decorative saddle where his hands (one clutching a lariat) rest. At lower left of this image is a facsimile signature of Autry -- almost side by side with this, at lower right of this image, an irregularly-clipped slip (roughly 3¼" X 1¼") bearing his actual signature in blue ballpoint has been neatly affixed. Several small tape stains at margins. Signature undated, but circa 1960. Once Gail Davis's syndicated "Annie Oakley" series (1854-57) came off the air, she toured with Autry in his traveling rodeo for several years. Despite mild wear both to program and signature, an appealing and very displayable image. New York: The Dial Press, 1971. Hardcover. Small 4to. Blue cloth with yellow spine lettering, pictorial dust jacket. 497pp. Illustrations. Near fine/very good. Quite light jacket edgewear. Tight and nice second printing edition of this volume in the "Two Centuries of American Life: A Bicentennial History" series. Even though the report on his first screen test was dismal ("Can't act. Can't sing. Can dance a little. "), the genial hoofer became one of the most innovative and influential dancers in film history; his collaboration with Ginger Rogers resulted in such classics as "The Gay Divorcee" and "Top Hat"; other notable appearances include "Holiday Inn" and "Funny Face." IPS (magazine stock), 7½" X 10½", n.p., 1960. Near fine. 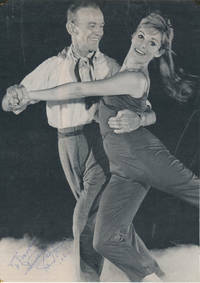 This candid informal full-length black and white shot (likely from a "Life" magazine profile) shows Astaire dancing with an unidentified smiling woman against a dark background and foggy floor. He boldly inscribes and signs in blue ballpoint in a light area at lower left: "To Donald Burnell / Sincerely / Fred Astaire / 1960." Attractive example. New York: Duell, Sloan and Pearce, 1963. Hardcover. Small 4to. Red cloth with gilt spine lettering, pictorial price-clipped dust jacket. 144pp. Illustrations. Near fine/very good. Jacket faintly edgeworn and well rubbed; abrasion on front flyleaf. A tight, nice first edition of this anecdotal reminiscences of Hollywood pals including (to cite front jacket panel) Jack Benny, W.C. fields, Bea Lillie, Groucho Marx, Al Jolson, Will Rogers, Greta Garbo, Judy Garland, George Jessel, James Cagney, Red Skelton, Jimmy Durante, Fanny Brice, Danny Kaye "and many other great stars of show business." New York: The Dial Press, 1971. Hardcover. Small 4to. Blue cloth with yellow spine lettering, pictorial dust jacket. 497pp. Illustrations. Near fine/very good. Mild jacket edgewear. A tight and attractive second printing edition of this volume in the "Two Centuries of American Life: A Bicentennial History" series. This American actor appeared in numerous stage productions (notably Cole Porter's musical "Can Can," 1953) and films of the 1940s and '50s, often with his wife, actress Beatrice Straight (1914-2001). Bold and handsome signature in blue ballpoint on a heavy stock 5" X 3" card, n.p., dated 14 October 1989 in his hand. Fine. With original envelope -- addressed, surprisingly, in the hand of Straight, who also signs her husband's name above the printed Southfield, Massachusetts return address on envelope verso! Identical twins Billy and Bobby Mauch were child stars of the 1930s, best remembered for the 1936 film "Anthony Adverse" and the 1937 Errol Flynn film "The Prince and the Pauper" and for three film adaptations of the Booth Tarkington "Penrod" novels. Inscription and signature, heavy stock 4½" X 6½" greeting card (opens to 9" X 6½"), Woodland Hills, CA, n.y. [postal cancellation 19 December 1985]. Very good. Minor edgewear. On the blank inside left panel of this religious-theme Christmas card, the actor boldly pens a holiday message in blue fineline: "To Richard -- My best wishes to you and yours this holiday season, Sincerely, Bill Mauch." With original envelope, addressed by Mauch. Mauch had long since retired from acting by this time and for decades had worked for the studios as a sound editor, with credits including the famous car chase scenes in "Bullitt." Uncommon. This American actress appeared often on stage and in many films between 1941 and 1990, but will forever be remembered as the ditzy sophisticate "Lovey," wife of Thurston Howell III, on the television comedy "Gilligan's Island" (1964-67). Sloppy vintage signature on dark ink on a 3 3/4" X 2¼" slip, n.p., n.y. Very good. Attractive early example, undated but likely 1940s. London: George G. Harrap and Company Ltd, 1946. Hardcover. Small 8vo. Blue cloth with cream spine lettering, dust jacket. 260pp. Near fine/good. Jacket complete and fairly attractive, despite edgewear and a number of edge chips and archivally closed (on verso) separations. A tight and nice first edition of these later theatre essays. Front flyleaf bears the nifty circular blind-embossed ownership imprint of noted television character actor Robert Casper (b. 1924). New York: Hill and Wang, 1961. Hardcover. Edited by Herbert Van Thal. Introduction by Alan Dent. 8vo. Burgundy cloth with silver spine lettering, dust jacket. xxiv, 288pp. Near fine/near fine. A superb and tight first edition of this posthumous gathering of the famed critic's best theatre essays. Front flyleaf bears the nifty circular blind-embossed ownership imprint of noted television character actor Robert Casper (b. 1924). Washington, DC: United States Government Printing Office, 1958. Paperback. Small 4to. Wrappers, stapled. vi, pp. 2475-2601, iii. Very good. Outer wrappers (only) slightly worn, rubbed and age toned, with couple of discrete archivally closed tears. Nice, tight first edition of these hearings that took place on May 8 and April 1, 1957 and June 18-19, 1958, featuring interviews with 21 "persons of interest" (not film stars or celebrities). The lesser-known older brother of America's first great stage star, Edwin Forrest (1806-72), was a printer who gave it up to pursue acting, also managing Philadelphia's noted Arch Street Theatre with business associate William Duffy; he died suddenly after an appearance on stage. ADS, 1p, 4" X 2", n.p., n.y. Very good. Mild age toning. Boldly penned "Received of Mrs. I. Duffy $40 / 62½ cents / Wm Forrest / Thursday, June 18" in brown ink. Recipient is unknown, though likely related to Forrest's business partner William Duffy. Unusual. New York: D. Appleton and Company, 1926. Hardcover. 8vo. Teal blue cloth with gilt lettering and decoration. xxvi, 582pp, (1p ad). Frontispiece, illustrations. Very good. Mild binding edgewear. 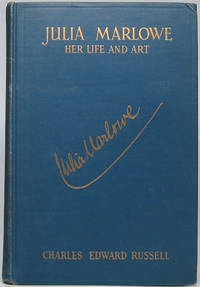 A tight and nice first edition of this hefty biography of the English-American actress (1865-1950). Front flyleaf bears the nifty circular blind-embossed ownership imprint of noted television character actor Robert Casper (b. 1924). London: George G. Harrap & Co. Ltd, 1945. Hardcover. Small 8vo. Blue cloth with cream spine lettering. 230pp. Frontispiece. Very good. Spine ever-so-faintly sunned, else internally fine. 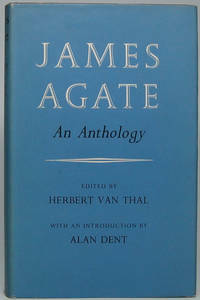 Quite tight and nice first edition of the first volume of Agate's 3-volume memoir. Front flyleaf bears nifty circular blind-embossed ownership imprint of noted television character actor Robert Casper (b. 1924). London: George G. Harrap and Company Ltd, 1942. Hardcover. Foreword by Osbert Sitwell. Small 8vo. Blue cloth with cream spine lettering, price-clipped dust jacket. 271pp. Near fine/very good. Jacket a bit edgeworn. Old inkstamped "Purchase at U.S.P.S. Auction" on front pastedown. Quite tight and attractive first edition of these essays covering, as jacket front panel notes, "Autobiography Biography Drama Essay Fiction History Sport." Front flyleaf bears the nifty circular blind-embossed ownership imprint of noted television character actor Robert Casper (b. 1924). New York: Crown Publishers, 1951. Hardcover. Introduction and notes by Jacques Barzun. 8vo. 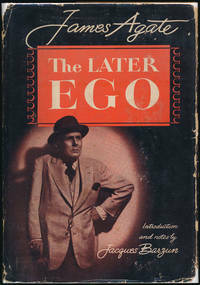 Tan cloth with brown spine lettering, pictorial price-clipped dust jacket. x, 625pp. Near fine/very good. Jacket mildly edgeworn and a tad rubbed, with a few tiny edge chips. A tight and nice first of this U.S. edition, being the final two volumes (first published in London in 1947 and '48) of this influential between-the-wars diarist and theatre critic's theatre-heavy journals. Front flyleaf bears the nifty circular blind-embossed ownership imprint of well-known television character actor Robert Casper (b. 1924).